Review • Strong comic acting, onstage chemistry and a live orchestra help ground a stage show packed with special effects. Ivins • Decades ago on my first trip to Europe, I saw an outdoor production of the opera "Aida" at the Caracalla Baths in Rome on July 4th. Since I don't speak Italian, I don't remember much about the story, but I do recall the spectacle of live horses on stage and fireworks in the sky at a climatic point of the production. 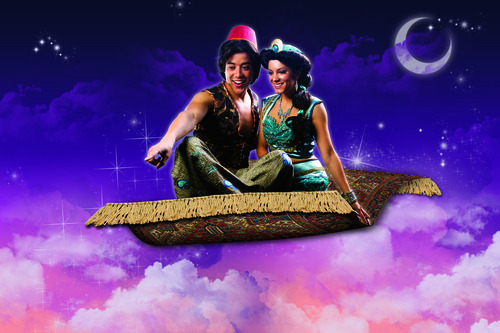 That memory came to mind Monday night while watching the special effects-laden "Aladdin," the timeless tale of a boy, a girl and a Genie at the sold-out Tuacahn Amphitheatre. Chances are most people coming to this amazing show have seen the animated Disney movie, with Robin Williams' voicing the Genie, creating a character that is something of a spectacle. But this stage production deals in a dazzling array of special effects, which began with three live camels walking across the stage before a word of dialogue was spoken. During the 2 1/2-hour production, the show would utilize onstage pyrotechnics, fireworks over the outdoor stage, projections on the red rocks behind the stage, a procession of actors wearing electric lights, a flying carpet, a replica of the Sphinx, and a monster guarding the "Cave of Wonders" projected on a misting fountain of water. The most unusual special effect was the use of a stereophonic 3-D screen that required special glasses, which I had never donned before at a stage musical. Aladdin, ably played and sung by Dan Domenech, interacts with the screen, creating some interesting illusions that include a rather frightening giant spider and a magic lamp that appears to hover over the audience. All this spectacle raises the question: Do the special effects overwhelm the show? Surprisingly, the answer is no. The show started slowly, and it took awhile for the audience to be engaged with the story. But once the wisecracking blue Genie  played with just the right amount of hilarity by Edward Juvier  shows up on the scene, the dramatic magic began. The show mixes modern references with an ancient tale. At one point, Juvier jokes that he had to get this role because he wasn't blue enough to be in "Avatar" and didn't want to play a Smurf. But through all the fun, magic and stage pyrotechnics, Juvier brings a basic, sympathetic humanity to his role. And "Aladdin" wouldn't work if there were no chemistry between its leads, Domenech as Aladdin and Haley Carlucci as Jasmine, the princess he longs to love. Domenech and Carlucci offer that, as well as wonderful voices and looks that fit their roles. The supporting cast, especially Paul C. Vogt as one of Aladdin's three friends who serve as narrators to move the production along, was uniformly good. And the live orchestra was flawless, playing a score that included memorable songs such as "Friend Like Me" and "A Whole New World," the latter that featuring Aladdin and Jasmine flying on a "magic" carpet high over the audience. All of these elements will make this a tough ticket this summer, as many of the shows are already sold out. Last year, some 20,000 people were turned away for Tuachan's production of "Little Mermaid" and that could easily happen for "Aladdin" this year. Flashy special effects, including 3-D, a strong cast and classic story, make this good family fun. Musical tickets • $23.50-$79.50; at 800-746-9882 or 435-652-3300, or visit tuacahn.org for more information. Shows • Through Aug. 31 and Sept. 3-Oct. 19; call the box office for start times and show dates.